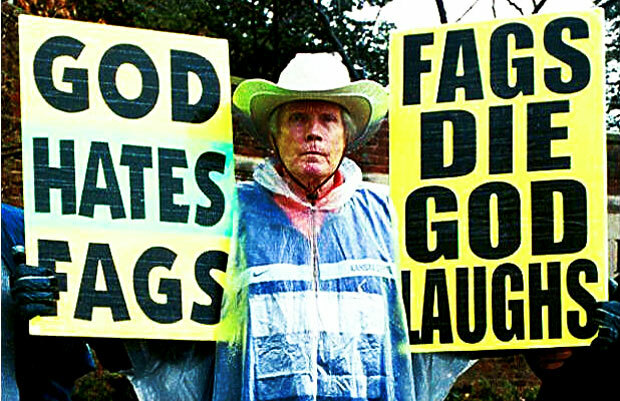 Cult Leader And Hate Preacher Fred Phelps Dead At 84. If YOU are a lost sinner, run to Jesus with open arms and ask Him to save you in His Shed Blood. The bible says He absolutely will save all those who come to God through Him. Shame on you, Fred Phelps. You were not a Christian. (CNN) – Fred Phelps. the founding pastor of a Kansas church known for its virulently anti-gay protests at public events, including military funerals — has died, the church said Thursday. The 84-year-old died of natural causes at 11:15 p.m. Wednesday, according to church spokesman Steve Drain. God does hate homosexuality, He calls it an abomination in the bible. But Jesus Christ died to set the homosexual free from Hell. Click image to see how to not go to Hell. Phelps founded Westboro Baptist Church of Topeka, Kansas, in 1955 and molded it in his fire-and-brimstone image. Many members of the small congregation are related to Phelps through blood or marriage. Click image to see how to not go to Hell. Many members of the small congregation are related to Phelps through blood or marriage. run to Jesus with open arms and ask Him to save you in His Shed Blood. The bible says He absolutely will save all those who come to God through Him. States Buck Public Opinion, Offer Driver’s Licenses to Illegals. Nevada has become the latest state to allow illegal immigrants to obtain a driver’s license — even as public opinion polls show that the great majority of Americans oppose such measures. A national poll conducted in October by Rasmussen Reports found that 68 percent of likely U.S. voters think illegal immigrants should not be allowed to obtain state driver’s licenses. Just 22 percent favor licenses for illegals in their state. Critics say the laws encourage illegal immigration by legitimizing the status of those who come to the United States illegally. “It is a kind of amnesty. It doesn’t given them any legal status, but by giving them a government-issued ID, it helps them imbed in society,” Mark Krikorian, executive director of the Center for Immigration Studies in Washington, D.C., said in an interview with Newsmax. In Nevada, Democratic-led lawmakers approved a driver’s license law in 2013. It was signed by Republican Gov. Brian Sandoval, the state’s first Hispanic governor, who considers it a public safety measure, and went into effect at the beginning of this month. “Allowing undocumented immigrants to obtain a driver’s privilege card will increase the number of drivers on Nevada’s roads that are insured and aware of traffic rules and regulations,” Sandoval said in a statement after signing the bill. When Nevada began issuing licenses on Jan. 2, long lines formed at the Department of Motor Vehicles in Las Vegas, waiting for the 8 a.m. opening of the office. The Associated Press reported that “thousands of Nevada immigrants” sought to obtain licenses on the first day. Those applying for the driving privilege cards must show some proof of their identity as well as evidence of Nevada residency and insurance. New drivers must pass a driving test, and pay to retake the test if they fail. The information provided for the licenses, however, may not be used against them for purposes of enforcing immigration laws, a key provision in a state like Nevada where about a fourth of all residents are Latino. Other states that have approved similar laws include Utah, Washington, Maryland, Oregon, Connecticut, California, New Mexico, and Illinois, along with the District of Columbia. The climate of permissiveness licenses for illegals follows a crackdown period after the September 11, 2001 terrorist attacksthat came in response to widespread fears of foreign-born terrorists entering the country. “After 9-11, things were tightening up. Now those states that are mainly run by Democrats are backtracking,” said Krikorian, noting that Congress has given leeway through the REAL ID law to states to issue immigrant driver’s cards, but those cannot be used for federal identification purposes like boarding planes. New Mexico, with the nation’s largest Hispanic population, is one state attempting to buck the trend. Republican Gov. Susana Martinez is hoping to convince the Democratic-led state legislature to repeal the state’s current law, which offers licenses to illegals.She has tried before and failed, but vows to continue. Polling shows that Martinez has support for her position, said Brian Sanderoff, president of Research & Polling Inc., a New Mexico firm that has polled for the Albuquerque Journal twice on the issue. “Both times, the polls that we did for the Journal showed approximately 70 percent of registered voters opposed granting licenses to undocumented workers,” Sanderoff told Newsmax. “I think it’s a significant issue to the extent that the governor is once again latching onto it,” he said. New Mexico differs from its heavily Hispanic neighbor Arizona, where its governor, Republican Jan Brewer, has taken an aggressive stance against illegals in her state. In New Mexico, most Hispanic residents are natives, tracing their lineage back to Spain, said Sanderoff. “Most New Mexicans are Americans, born and raised here, more so than the average state,” he said, which likely explains why voters there oppose the law by a wide margin. The trend could continue as Congress renews its debate on immigration reform this year and proponents continue to push for the measure in more states. States, Insurers Seek Ways to Bypass Obamacare. Some insurers and at least one state are seeking ways to decouple from the improved but still flawed federal HealthCare.gov site, The Wall Street Journal reported. Connecticut, which runs its own Affordable Care Act insurance marketplace, aims to establish enrollees are legal residents without relying on the need to tap into the federal system. In addition, the Centers for Medicare and Medicaid Services is also developing work-arounds that would reduce the need for call–center workers to turn to the federal site when calculating the value of tax credits. This would speed the processing of straightforward applications, according to the Journal. While navigating the site is now more problem-free for average users, the issues of identity-verification and accurate enrollment data have not been resolved. Meanwhile, insurers continue to press the Obama administration for ways to enroll customers directly — though doing so undermines Obamacare’s goal of offering comparison shopping to consumers. Newtown To Vaporize All Evidence Of What Happened At Sandy Hook School Shooting. Google the Columbine school shooting and you will find no overt conspiracy theories attached to it. You will get the same results for Fort Hood and Virginia Tech as well. So why is the Sandy Hook School shooting – whatever really happened there -being treated with a disproportionate sense of secrecy and urgency? Could it be the “crisis actors” that kept popping up in all the news photos? Or perhaps it was the complete lack of documentation that a school shooting had actually occurred. Maybe it’s the complete absence of any photographic proof of dead bodies, or what is obviously staged, emotionless actors walking around in circles. Or, maybe it was this poorly trained actor pretending to be a grieving father caught on a hot mic laughing when he thought the camera was not yet on. We invite you to watch these 3 videos and make up your own mind. Whatever it is, one thing is for sure. This school is not simply being torn down, it is being vaporized at the molecular level to prevent anyone or anything from discovering the truth of what happened there that day. NY Daily News: When the demolition is done, almost every trace of the doomed Newtown school will be gone. The bricks and glass that once comprised the Sandy Hook Elementary School will be pulverized. The steel that supported the structure where a madman with a Bushmaster AR-15 rifle massacred 20 first graders and six brave staff members will be melted down. And all of it will be hauled off to what officials are calling an “undisclosed location” to spare the Connecticut town more trauma. Only the memory of the horrors that happened on Dec. 14 — and dust from the debris — will remain when the school is razed next week. “We want to be absolutely certain to do everything we can to protect the privacy of the families and the Sandy Hook community,” town official Patricia Llodra told the Associated Press. Demolition is expected to be finished before the first anniversary of the massacre. In its place, Newtown will build a new school funded by a $49.3 million state grant. The destruction — and the construction — will be handled by a project management company called Consigli Construction, which has been sworn to secrecy, The News-Times of Danbury, Conn., reported. Barricades will be erected around the work site. Security guards will be posted to keep the curious away.And construction workers may be subjected to background checks and will be forbidden to discuss what they are doing. source – NY Daily News. Sisters: Capitol Police Wrongfully Shot Woman. A Connecticut woman who rammed her car into a White House gate last week was not delusional — only frightened and trying to run away from police — when she was fatally shot, her family told the “Today” show Monday. Miriam Carey, 34, was in the wrong place at the wrong time Thursday, her sisters said. “My sister was fleeing. She was trying to figure out how to get out of there,” sister Valerie Carey said. The family also disputed that Carey, a dental hygienist, was delusional and thought President Barack Obama was trying to communicate with her. Valarie Carey made similar remarks to the Daily News the day after the violence, saying her sister had been treated for post-partum depression but was being taken off her medication. “But that doesn’t mean she’s crazy or that she deserved to have been killed,” she told the News. Carey had driven to the nation’s capital with her 1-year-old daughter, and was spotted speeding through the streets. Armed police, with their weapons drawn, ordered her to pull over, but she refused. At one point she was seen completely stopped and surrounded by officers before she rammed a cruiser blocking her path and sped away. Police say Carey was suffering “serious degradation in her mental health” and that sparked the incident, the News reported. Rep. Mike McCaul: DC Suspect Had No Weapons in Car. Law-enforcement officials declined to say whether the woman shot and killed by police in Washington, D.C., Thursday had weapons, but a member of Congress says he was told that she did not. “From what I understand, she didn’t have any weapons in the car,” Rep. Mike McCaul, R-Texas, told CNN on Thursday. McCaul, chairman of the House Homeland Security Committee, described the person who rammed a barricade near the White House before leading police on a chase several blocks to the Capitol as a 34-year-old woman from Connecticut. None of the information McCaul gave to CNN has been confirmed by Washington’s Metropolitan Police Department, which is heading the investigation. Police shot the woman to death after her car crashed near the Capitol. She reportedly refused to follow police orders. The woman may have had mental health issues, McCaul said he has been told by multiple sources. The woman’s 18-month-old daughter was in the car, but was unharmed in the incident. McCaul said he was told by Homeland Security and the FBI that the incident is likely isolated and not connected to terrorism. “It hasn’t been ruled out completely,” McCaul told CNN, and the FBI is digging into the woman’s background. A reporter at an earlier press conference with police officials asked whether the woman, who was black, was of Somali descent. Police would not answer that question, or any others about the suspect, and McCaul said he is unaware whether the woman is American or an immigrant. He also said he has not been told her name. Aetna Pulls out of New York Health Insurance Exchange. Aetna Inc, the No. 3 U.S. health insurer, said on Thursday it has decided not to sell insurance on New York‘s individual health insurance exchange, part of the country’s healthcare reform. New York is the fifth state where Aetna has pulled its application to sell the plans that go on sale on Oct. 1 and into effect on Jan. 1, 2014. It has also reversed course in Maryland, Ohio, Georgia, and Connecticut, where it is based. Aetna spokesman Cynthia Michener said it made the move after assessing its business strategy, following the acquisition of smaller insurer Coventry Healthcare in May. Coventry also filed applications to sell plans in more than 10 states. “Our goal for 2014 is to participate in a limited number of state exchanges where we can be competitive and add the most value to the market,” she said in an emailed statement. She said the company will continue to serve small business and large business customers in New York and will offer individual products outside of the exchanges. New York’s market for individuals is currently only about 17,000 people, but the exchange is expected to bring in 1 million people during the first three years. The exchange announced insurance participants on Aug. 20. Aetna was not on the list.